Image caption The existing market in Basingstoke is currently operating in a temporary location in Wote Street while Market Place is repaved. Stall owners in Basingstoke have said they have been forced to stop trading on their most lucrative day to make way for a farmers' market. 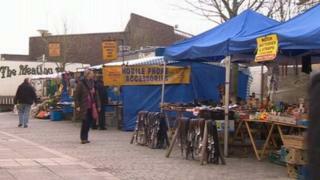 The council said the current town centre market was "not thriving" and that residents wanted a "better" one. The existing twice-weekly market cannot now trade on the final Saturday of the month. But the traders claim this is their "best trading day" and insist they can operate alongside the new market. Butcher Phil Howe said the last Saturday was the busiest because "people get paid monthly and they come and bulk buy from us". Basingstoke and Deane Borough Council wrote to market traders telling them that the event, run by Hampshire Farmers' Markets, would take place on the final Saturday of each month. "We regret that this will result in you losing a day's trading," it stated, "and hope that you will be able to make alternative arrangements". Deputy council leader Councillor Ranil Jayawardena said residents had old the council they wanted "a better market". He added the authority would help the existing traders find an alternative site. The council's Top of the Town proposals states it aims encourage independent shops, cafes and specialist markets in order to make Basingstoke a more attractive destination.